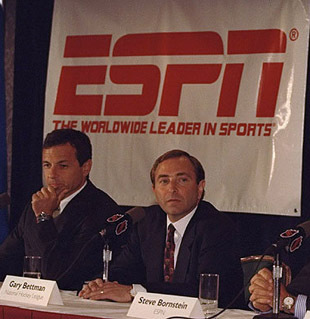 ESPN and Gary Bettman had a bitter divorce during the last NHL lockout, with ESPN lowballing the League with an offer and Bettman splitting for the great unknown of the OLN network (which became VERSUS, which is now NBC Sports Network). To this day, there are still people around hockey who lament the fact that ESPN doesn't promote and cover the NHL, which allegedly has hindered its growth in the U.S.
With the NHL locked out again, ESPN has decided to take another chance on pro hockey — and NHL players. ESPN signed the Kontinental Hockey League to a broadcast deal for the 2012-13 season, according to the League's website. The Kontinental Hockey League has reached an agreement with the US sports TV channel ESPN to broadcast games in the 2012/2013 KHL Championship. The games will be shown on the ESPN3 channel in the United States, Territories of the United States, and also in Great Britain. ESPN3 reaches 73 million American households and devotes most of its output to live broadcasts of events, including college football, college basketball, the NBA, MLB, ICC (International Cricket Council) competitions and qualifying matches of FIFA tournaments. Lev vs Dynamo Moscow on Oct. 9th. If you're not familiar with ESPN3, it's an online streaming service that's currently not available in the U.S. as a standalone digital cable channel. So it's not as if you can flip over to the Tres and watch Bucci and Chicken Parm rock "The KHL3Night ". We all know what happens when ESPN adds a property to the empire: a miraculous increase in coverage on all of its properties. This is a great move for the KHL, a nice add for the ESPN3 service (of which many hockey fans are hearing about for the first time today) and a little dirt in the eye of the NHL, given their history and the scores of players starring in the KHL right now. • Video: Tebow time in New York?